My sister has always been a natural when it comes to baking. I guess it makes sense when you’re born with the sweetest tooth known to man! I’ve been asking her to guest blog for months, and now she finally got to it! I can’t wait to visit Santa Barbara soon. You can see my previous trips here and here. 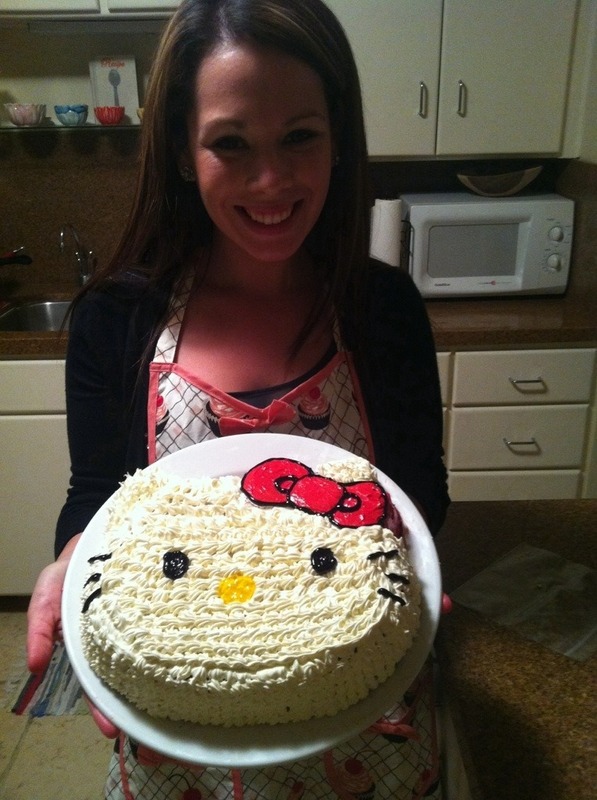 Here is her Red Velvet Hello Kitty cake. I just came to say…Hello! One of my favorite hobbies is baking because it takes my mind off everything but what I’ve got in front of me. I bought this Hello Kitty cake mold last year and hadn’t found the right occasion to use it…until tonight! Tomorrow is my friend Kaitlin’s birthday and I thought she would like this cake since we both share a common love for this cute little kitty. I had a blast decorating this sweet little treat tonight! p.s. she is wearing the Charlotte apron. You can find it here. I love the pictures, the stories, and the step by step hello kitty cake! Me too! I just wish I could have some!